I have been given the opportunity to join in a giveaway for a PlasmaCar. PlasmaCar is amazing. 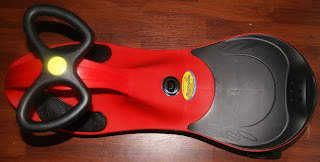 It is a ride on toy that does not require batteries or electricity of any kind. It is 100% kid powered. What makes PlasmaCar really unique though is that it does not need to be peddled either. PlasmaCar is propelled by turning the wheel back and forth. 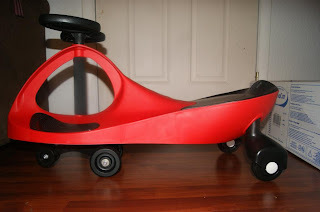 It has a front wheel that is shorter than the rest, so that it only touches the ground when the wheels are turned, and that is what makes the car go. It is really neat. I love that it is has 4 wheels(besides the very front wheel), so there is no need to be concerned with balancing. It makes it so much sturdier. This is VERY sturdy, and durable too. It holds up to 220 pounds. That means that I, or even my husband can ride it. That is so impressive. Most toys like this barely hold 50-60 pounds. I love that I won't have to worry about my son getting too heavy for this. My not so little boy will be 11 in July. He is a pretty big boy for his age. On most ride ons, he would already be too heavy. Since he is Autistic, he is not fully able to ride on anything too complicated or dangerous either, so I especially love how easy and safe this is. It is very low to the ground, and no brakes to worry about, he can just use his feet. It would be very hard to tip over, and hard to go too fast. I am joining Andrea's World on this awesome giveaway and you can read her complete review HERE. ****Reviewz & Newz is not responsible for fullfillment of this prize. Please use the Rafflecopter form below to enter the give away! This sounds like a safe and good toy for any child with little to no balance! I know I had and still have none!! Glad you found this for your son. I am fascinated by the technology! I bet it is a sight to see it in motion. You mentioned that it will hold up to 220 lbs, but how large is it? Is it sized for a child that would normally fit a tricycle or for an older child? I love the fact that this plasmacar will be there for your child even as he/she grows. It is very sturdy and will provide balance for your child. I love it! This looks like a lot of fun. I love the fact that it can hold up to 220 pounds that is really impressive. I had heard of these before but forgot about them. Thank you for the chance to win one. My kids has one of this, they love it! Even I, loved it lol. WOW! Something cool for the kids even I can use! Can't wait to try it! I wanna ride and I am an adult! my kids love their plasma car, and if I can have a chance to win one, it will be great, that way my 2 girls won't fight who rides first. I like that kids are getting some exercise while using it! No Batteries no pedals. Get OT for my son. I love that this is a "green" toy - no batteries or electicity needed. I love that it's a safe green toy that my children can play with. I don't have to worry about the environment or their safety. I like that it is low to the ground - safe and easy to use!